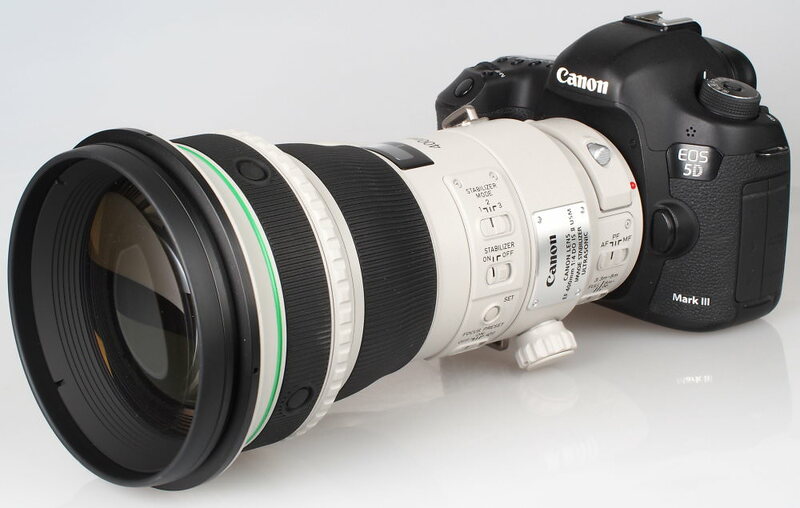 Gary Wolstenholme reviews the 400mm f/4 DO IS II USM telephoto lens from Canon. A professional-grade telephoto lens, which sports a moderately fast maximum aperture of f/4, image stabilisation, silent focusing with full-time manual focus override and a relatively compact design, thanks to the use of Diffractive Optics. This is quite a specialised lens, costing around £7000, so we'll take a close look at how it performs in this review. This lens bears all the hallmarks of Canon's high-end telephoto lenses in its design and build, including the off white paint finish designed to make the lens easier to handle in hot, direct sunlight. Tough, weather sealed construction is complemented by chunky switches that are easy to operate in a hurry, and possibly even when wearing gloves. As a result, this is a reasonably heavy lens, weighing 2.1kg. Even so, it just about balances well with the Canon EOS 5D MkIII body used for testing and its size, and weight make it fairly comfortable to hand-hold. Auto focus is powered by a ring-type Ultrasonic motor, and focusing is extremely fast and is virtually silent. Manual adjustments can be made at any point by turning the focus ring and focus lock buttons are provided on the lens barrel for focusing and recomposing. The focusing ring is smooth, with just the right amount of resistance to make applying fine manual adjustments a pleasure. 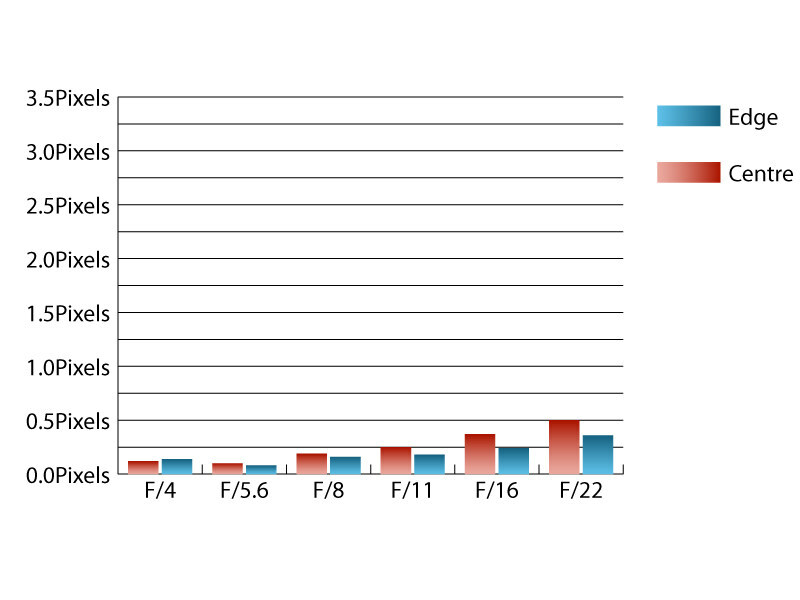 Minimum focus is 3.3m from the sensor plane, which is typical for a lens of this focal length and aperture. 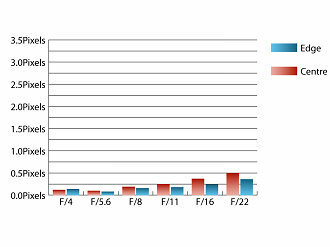 Focusing is performed internally and the lens accepts 52mm filters that drop into the rear section of the lens. A deep circular hood and hard lens case are also supplied as standard. Canon's 1.4x and 2x teleconverters can both be used with this lens to add more flexibility, although using a 2x converter will result in a slow maximum aperture of f/8 with this lens, which may also cause autofocus issues on some Canon camera bodies. With care, it is possible to take sharp images handheld using the image stabiliser at shutter speeds as low as 1/25sec, around half the time. This is roughly four stops slower than the usual rule of thumb for shooting handheld will allow. The image stabiliser also holds the viewfinder image very steady, which can help with focusing and composition. As you might expect from a lens that commands such a high price, this lens performs superbly as far as sharpness is concerned. Diffraction appears to be the ceiling for performance, with this lens delivering outstanding sharpness across the frame at maximum aperture. 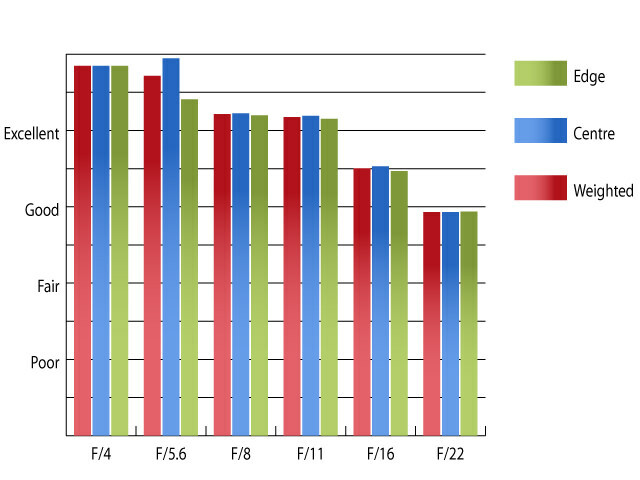 Although sharpness in the centre of the frame peaks at f/5.6, on the whole, performance is reduced gradually as the aperture is stopped down. It would be a big ask for Canon to defeat physics to improve performance in this respect. Sharpness remains excellent across the frame, until the aperture is stopped down beyond f/11. Chromatic aberrations are extremely well controlled, just about reaching a half of a pixel width at f/22 in the centre of the frame. This low level should pose no issues, even in large prints and harsh crops from the edges of the frame. Falloff of illumination towards the corners is well controlled for a lens of this focal length and aperture. At f/4 the corners of the frame are 1.04 stops darker than the image centre and illumination is visually uniform with the lens stopped down to f/8. Distortion is extremely mild with Imatest detecting only 0.23% pincushion distortion. This level of distortion is so low, that there should be no need to apply corrections in image editing software afterwards. A deep circular hood is supplied as standard with this lens, which does an excellent job of shading the lens from extraneous light that may cause issues with flare. Even without the hood, the lens is extremely resistant to flare and contrast remains high when shooting into the light. 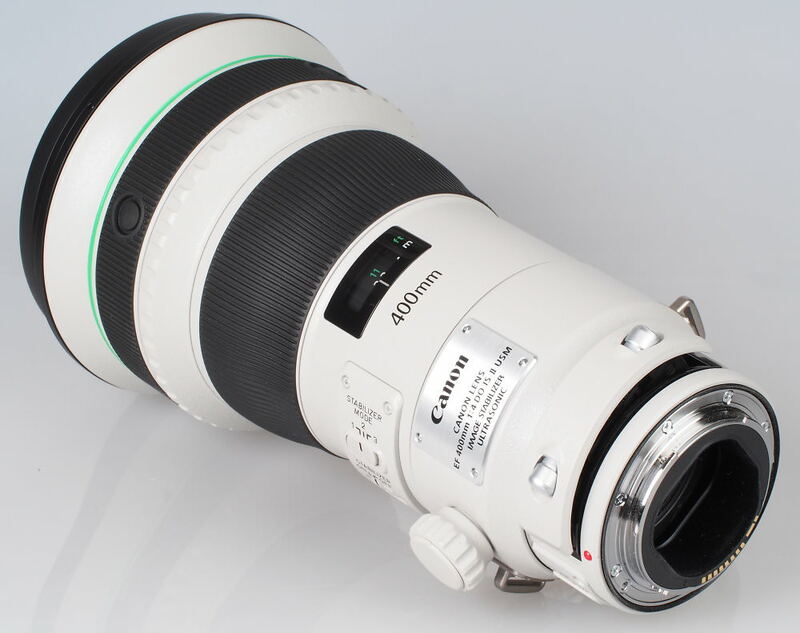 Due to the use of diffractive optics and professional 'L series' build quality, the price of this lens sits firmly at the exotic end of the scale as far as Canon's range of telephoto lenses are concerned. In fact, save another £700 and you can have Canon's 400mm f/2.8 lens. Those with an eye for a bargain will see that some places still have stock of the first version of this 400mm f/4 DO lens. With this lens being priced from around £4500, it would seem silly to ignore if you're in the market for a lens like this. Despite the price, this lens certainly makes an interesting prospect for those who find the size and weight of a traditional 400mm prime simply too much to be carrying around. The relatively compact dimensions make this lens fairly easy to hand-hold, especially when compared to this lens' larger and slightly more expensive f/2.8 brother. Due to its exemplary performance, you'd be hard pushed to not be pleased with this lens. Even though it is expensive, it's probably worth saving for. 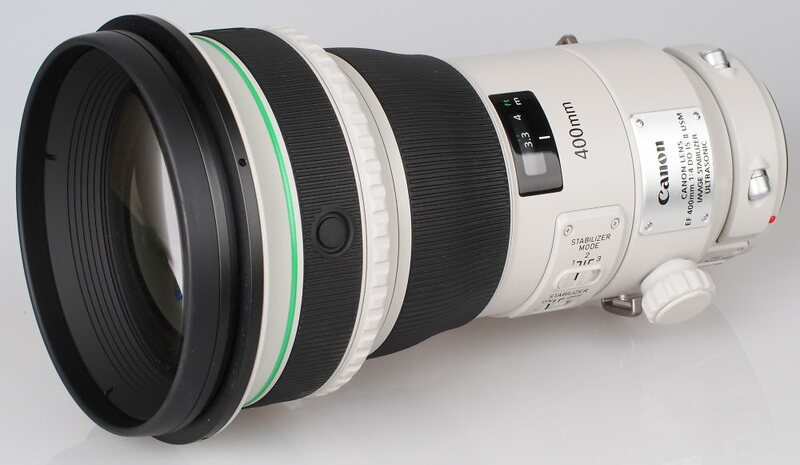 The Canon EF 400mm f/4 DO IS II USM give outstanding sharpness and excellent build quality. Canon ERC-E5MÂ ?Â Rain cover for cameras and lenses.